originally published in Mademoiselle in 1956. I must admit, if you mention Truman Capote, Christmas is not the first thing that comes to mind for me. I think of him as a brilliant writer, a New York intellectual, an openly gay man in a society which saw that as a crime, a man of idiosyncrasies, and the author of Breakfast at Tiffany's, Other Voices, Other Rooms and In Cold Blood. Also, he was barely taller than me (which is something I always make a note of when possible). I also think of him as Harper Lee's childhood friend, echoed in some respect in her To Kill A Mockingbird as Dill (just as he probably drew on her in the creation of Idabel in Other Voices, Other Rooms -- I would definitely recommend reading the two novels together; all the more so because they do not tell the same story, but both still manage to portray the coming of age in a world of irrational prejudice). Today's story is in fact based on memories from the same period and the same place as Harper Lee's book (the great depression and Monroeville, Alabama, respectively). But be that as it may, Capote is a Christmas writer (more than once, in fact: there is also the later and somewhat less heartwarming "One Christmas"). 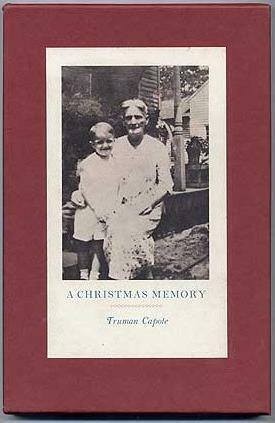 "A Christmas Memory" is nostalgic, detailing the child's memory of Christmas preparation and Christmas celebration on the margins of the grown-up world; but it is also tinged with sadness and loss. And, while apparently sweet and nostalgic, I would argue it carries a bit of a political kick (though that may just be me). "Oh my," she exclaims. "It's fruitcake weather!" The person to whom she is speaking is myself. I am seven; she is sixty-something. We are cousins, very distant ones, and we have lived together -- well, as long as I can remember. Other people inhabit the house, relatives; and though they have power over us, and frequently make us cry, we are not, on the whole too much aware of them. We are each other's best friend. She calls me Buddy, in memory of a boy who was formerly her best friend. The other Buddy died in the 1880s, when she was still a child. She is still a child. But before these purchases can be made, there is the question of money. Neither of us has any. It explains the painstaking saving and year-long series of activities that have gone into providing the money for ingredients. There is even a brush with the black market. Of all the ingredients that go into our fruitcakes, whisky is the most expensive, as well as the hardest to obtain: State law forbids its sale. In fact, the apparently hard-hearted, scary man who sells the whisky (called Mr Haha because he never laughs) turns out to be an ally. While they are counting out their pennies, he changes his mind and asks them to take the bottle without payment, and to send him one of their fruitcakes when it is done. They declare him a lovely man, and decide that his cake will have a whole extra cup of raisins (I think that is a good thing). The cakes, you see, are where the economic logic falls apart. They are not made to be sold. Nor are they part of a gift exchange logic. Friends. Not necessarily neighbour friends: indeed the larger share are intended for persons we've met maybe once, perhaps not at all. People who've struck our fancy. Like President Roosevelt. Likewise, they go out (with Queenie, the dog) to fetch a Christmas tree and evergreen holly for decoration. The tree is much admired as they return home. Once a car stops and the rich mill owner's lazy wife leans out and whines: "Giveya two-bits cash for that ol tree." Ordinarily my friend is afraid of saying no; but on this occasion she promptly shakes her head: "We wouldn't take a dollar." The mill owner's wife persists. "A dollar, my foot! Fifty cents. Goodness, woman, you can get another one." In answer my friend gently reflects: "I doubt it. There's never two of anything." My friend, surveying the effect, clasps her hands together. "Now honest, Buddy. Doesn't it look good enough to eat?" Queenie tries to eat an angel. I am building her a kite. She would like to give me a bicycle (she's said so on several million occasions: "If only I could, Buddy. It is bad enough in life to do without something you want; but confound it, what gets my goat is not being able to give somebody something you want them to have. Only one of these days I will, Buddy. Locate you a bike. Don't ask how. Steal it, maybe.") Instead, I'm fairly certain she's building me a kite. We're up, wide-eyed and wandering while we wait for others to waken. Quite deliberately my friend drops a kettle on the floor. I tap-dance in front of closed doors. One by one the household emerges, looking as though they'd like to kill us both; but it's Christmas, so they can't. The relatives, of course, do not understand that Christmas is all about that which is not necessary, that which is exceptional, handmade, unique and personal. Their presents are disappointingly sensible and utilitarian: socks, handkerchiefs, a hand-me-down sweater and a subscription to a religious magazine (presumably to counteract the corruptive effects of the whisky). Life separates us. Those who Know Best decide that I belong in a military school. And so follows a miserable succession of bugle-blowing prisons, grim reveille-ridden summer camps. I have a new home, too. Home is where my friend is, and there I never go. And there she remains, puttering around the kitchen. Alone with Queenie. Then alone. a morning arrives in November, a leafless birdless coming of winter morning, when she cannot rouse herself to exclaim: "Oh my, it's fruitcake weather! "And when that happens, I know it. A message saying so merely confirms a piee of news some secret vein had already received, severing from me an irreplaceable part of myself, letting it loose like a kite on a broken string. Were you looking for a happy ending? Ah, sorry. Life and sensible relatives intrude. They Know Best, after all. Though I will say the memory is a happy one. And well worth a read. In the meantime, here is the first part of a video adaptation from 1966. You can hear Capote narrating, with his rather characteristic voice. But I swear the short story is better.